another season down and no moose for me. Appreciate the effort. You do know there was one that was hanging around the base of North, most of the season, don't you? Might have been the most photographed moose in the US. I have a friend who videoed him for quite a while. Wouldn't that have to be a rural myth? Thinking of you, Howie. Sunday 7/26/10 6pm Center Fayston/Kew Vasseur Rds. He was a young male, not really that big, though with the scale of the mailbox, you get an idea as to the size. The mailbox comes to the height of the top of his front legs. Not this last weekend, but the one before, I was at the top of Super Bravo, and heard people talking about seeing a moose, under the chair. I pulled out my camera and rode down. And... He musta thought I was Howie. Have heard a lot of reports of one (maybe the same one? Maybe it is the turtle and the hare?) in a number of locations around the mountain. Going hunting today. I can feel it. This is my year. I switched deodorants. Something with musk wouldn't hurt. And try to play it cool. They can sense desperation. In general, though, moose encouters should be kept light and casual, so absolutely no colognes or scents with pheromones. That moose Lostone speaks about cancelled the kids Mtn Biking camp today.... and pics were taken- I am sure they will be on SB site soon. Come on, Howie, This IS your year. Before the first snow falls. 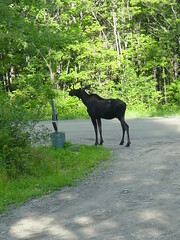 Howie, if you go to Sugarbush.com and to their photo gallery, you will see the aforementioned Lincoln Peak moose. I bet you will see it this summer/fall. Oh I know what the little critters look like. I got ten days coming up at the end of the month. Game on. Page 19 of this week's Valley Reporter.